Where is that pastor of yours? He drags me here across 27 centuries to talk to you and he doesn't even show up! He is probably scared because he’s familiar with my work. The book that bears my name in your Old Testament doesn't have a very good reputation. There are many who think that it's nothing but doom and gloom, threats, and destruction, fear and judgment. He's afraid of me. the face of the earth, says the Lord.3 I will sweep away humans and animals; I will sweep away the birds of the air and the fish of the sea.I will make the wicked stumble. I will cut off humanity from the face of the earth, says the Lord." I know that sounds harsh but in my day there were many people who followed the God Baal, people who worship stars, people who worship all kinds of foreign gods even wearing the clothes of those nations to be more like them. In my day, people were complacent saying, “The Lord will neither do good nor do harm because God is powerless.” Sound familiar? I believe you would call them spiritual but not religious today. They believe that God could not or would not either help them or harm them. He was just a powerless being watching helplessly over creation. That's why I wrote " That day will be a day of wrath, a day of distress and anguish,a day of ruin and devastation, a day of darkness and gloom, a day of clouds and thick darkness, a day of trumpet blast and battle cry against the fortified cities and against the lofty battlements." The truth is neither their silver nor their gold would save them. Neither their magnificent mansions nor their vast vineyards give them refuge. Neither powerful friends nor their huge egos could save them. I tried to warn them. 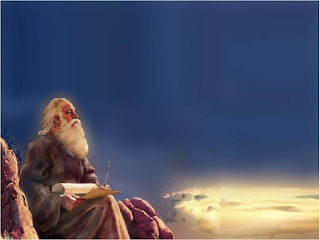 I wrote You better change "O shameless nation, before you are driven away like the drifting chaff, before there comes upon you the fierce anger of the Lord, before there comes upon you the day of the Lord’s wrath. " Why did I want to warn them? I don’t know. 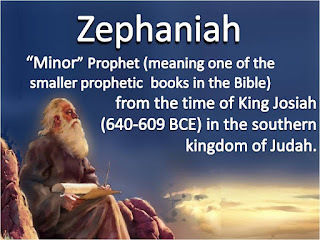 Maybe I wanted to warn them because, like my great-grandfather, the famous King Hezekiah, I really did care for the people individually, the nation as a whole, and our relationship to God. After Great Grandpa Hezekiah's death, of course, uncle Manasseh took the throne and led the nation down a terrible road. He seems to have forgotten that when the northern kingdom did that, they lost everything and were deported to Assyria. 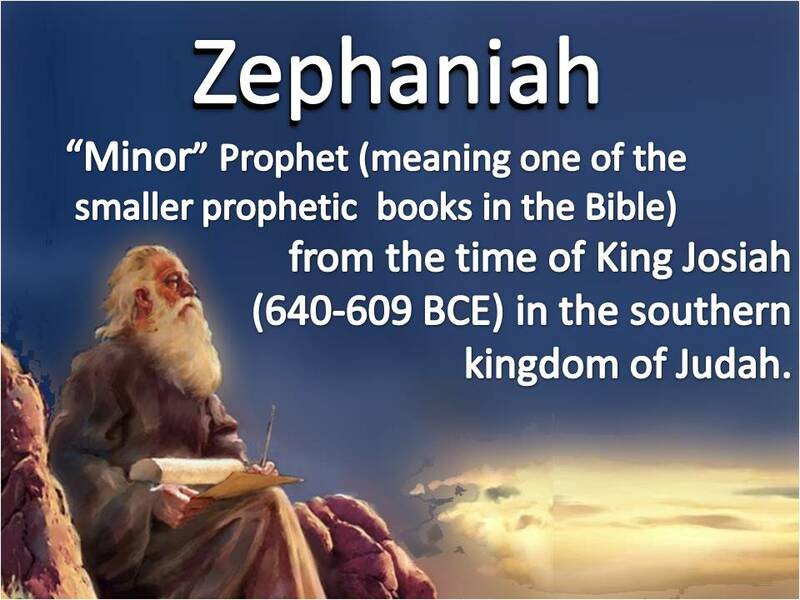 He encouraged the people to worship other gods, and undid the righteous policies of his grandpa Hezekiah. I blame Manasseh for a lot of the mess, but in the end, each person must take responsibility. I want them to know that they WILL face judgment. Of course, Manasseh didn’t live forever. Things have been better since Josiah became King. He tried to turn the nation back toward God. But it was too little too late. Josiah’s reforms would not last long. Soon the people of Judah would return to their wickedness and their rebellion against God and God would be forced to act. That’s what I tried to tell them. But they would not listen. It wasn’t long before Babylon swept through our nation, destroyed our cities, our homes, and everything we owned. Then to add insult to injury, they carried our people off to exile in Babylon. Some thought that was the day of the Lord of which I spoke. Though it was certainly an act of judgment, a direct consequence of the faithlessness of the nation, the day of the Lord is a much bigger picture than the Babylonian exile. Early on in my book, I write about God carrying a lamp through the streets of Jerusalem. I described God as looking for people who say in their hearts that the Lord will not, or cannot, do anything. The important part of that image is that on the Day of Judgment … on the darkest day in human history, God brought light to search out a remnant. God is a righteous judge, but deep down inside he is a savior. Yes, God searches out those who do not trust him for judgment, but more importantly, God brings a light to search through the darkness to save those who do. That’s what the last ½ chapter of my book is about. God is among us to save us. I am here to tell you that I didn’t know not at the time, but 650 years later, that same God who brought light to the dark streets of Jerusalem to save the people, saw fit to come as a light to the world in order to save the world. The day of the Lord is more than a day of destruction. It is more than a day of wrath. It is more than a day of distress. It is more than a day of anguish. It is more than a day ruin. It is more than a day of devastation. It is more than a day of darkness. It is more than a day of gloom. he will rejoice over you with gladness, he will renew you in his love; he will exult over you with loud singing.” The Lord, your God, is in your midst. The Lord, your God, is in your midst! Isn’t that amazing? No matter how I say it, or how many times I hear it, I can’t get over it. “The Lord, your God, is in your midst.” God is in the midst of his people not just for judgment, but for salvation. the Lord your God is in your midst, not just for judgment, but for salvation. 650 years after I preached the day of the Lord, God came in a way I never imagined. In Jesus Christ, God came as a “light of all people. The light shines in the darkness, and the darkness did not overcome it.” In Jesus Christ God came as the light not to destroy, but to save. Jesus had his own vision of the day of the lord. He said, “Today, I have come to preach good news to the poor to proclaim liberty to the captives and recovering of sight to the blind to set at liberty those who are oppressed and to proclaim the year of the Lord's favor.” Not just a day of judgment but a year of salvation. When I was preaching, some 650 years before Jesus, I couldn't imagine it. But when Jesus came, he was God in your midst. When Jesus came it was God in your midst for salvation, Hope, for singing, for shouting, for exultation, for victory. Some have said that the last half of the last chapter of my book doesn't belong there because it is so different from the rest. It offers a vision of God in our midst saving instead of slaughtering. Rescuing, rather than retaliating. Healing rather than hurting. Bringing light and life instead of death and destruction. In fact, both are true. God is a God who judges. God is a God who cannot tolerate the worshiping of other Gods, the harming of his people, or single-minded self-interest. That is all true. It is just as true, though, that God put on flesh, God put on skin and moved into the neighborhood not to judge, but to save. God was no longer way up there, unapproachable and incomprehensible. God was here in Jesus Christ bringing the light of divine love to the world that I couldn’t even imagine 650 years earlier. • God is a God who cannot tolerate the abuse of the poor at the hands of the wealthy, but instead of destruction, God came in Jesus preaching good news to the poor, feeding the hungry, and serving those whom no one else would touch. • God cannot tolerate the lies that make your needs, your wants, your wealth, and your power into the most important thing in the world. But instead of destruction, God came into your midst in Jesus Christ as an example of humility, and gentleness, and servanthood. • God cannot tolerate the darkness in which people live. A darkness created by their own unwillingness to open their eyes to God coupled with their blind refusal to open their heart to their neighbors. But instead of destroying you in the darkness of your night, God came in Jesus to be the light that shone in the darkness and the darkness could not overcome it. Not the darkness of my day, and not the darkness of your day. I am very aware that the beginning of my writing is dark and frightening and hopeless. But I'm grateful that God is bigger than the darkness, bigger than fear, bigger than hopelessness and that I was granted a glimpse, just a small glimpse, of a loving God not looming over us to destroy us but walking among us to save us.